It's not often that a good colour photo of an SLL loco in BR days appears and Geoff Plumb's is one of the best for a long time, and unusually it's hauling freight. 34053 is heading south west through Winchfield cutting with a long train of vans on the down slow line at about the point where the M3 motorway bridge now crosses the line. The headcode suggests a working from Nine Elms to Southampton Docks via Brentford, Chertsey and Woking. It was taken on Saturday 11th April 1964. Geoff has just published a book of his photos, The Geoff Plumb Collection - British Railways in the 1960s - Southern Region, and has an excellent online gallery, with plenty of Bulleids represented, though sadly no more of SLL's. The first quarter of 2019 has had its ups and downs. 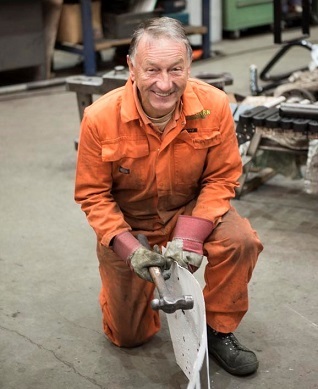 Bob Bevis's decision to retire was anticipated, though it changes the face of the workshop team nonetheless. Willie Bath has also also stepped back from day to day management of SLL workshop activities, though he remains engaged on our project management and sourcing of components. Pete Pickering will become a full time employee when his commitments at Tyseley are completed, not least his work there on both Manston and Sir Keith Park, and we're planning to recruit another full time staff member during the year. Swanage Railway are also revising their working practices, and we are looking for closer alignment with them in the future. Their purchase of four large portable jacks (ex-Eurostar North Pole depot) will permit work on axle boxes, etc, to be done on site, saving us significant transport costs. With only 80104 and 257 Squadron on lease cashflow has been lower that anticipated. That should change when work on Sir Keith Park is completed. Meanwhile our work is focused on getting Eddystone to the point where its boiler can return from Buckfastleigh and be installed. Work on Norman continues at Bryn Engineering; we have agreed to have a more complete rebuild of the cylinders and bottom end to give us a loco which can expect a full 10 years in service. The primary obstacle to completion of all these projects is money, and the support of our shareholders continues to be essential to our success. The superheater header and elements were moved to Buckfastleigh to be installed and steam tested by SDR Engineering. As the locomotive is not quite ready to accept the boiler, we expect to transfer it to a private site not far from Swanage where the cladding team can start the process of reinstating the casing etc. Once the middle engine is complete with the inside connecting rod reinstated along with pipework, we can return the boiler to Swanage. On the other hand the cost of the 150 finger bars to make up the grate has recently doubled - an unexpected and unwelcome bill. Work has started on the new smokebox, with a preliminary fit on the saddle to mark up the cut-outs for the chimney, etc. We also bought a new smokebox door, and this is being built up prior to welding to the smokebox. Eddystone's connecting rods need to be cleaned up prior to fitting. Ray, Geoff, Pete and Bob, get stuck in. Note U Class 31806 on the new jacks in the background. Examination of the axle boxes showed that they all need repair, and this work is now under way at Tyseley, with Pete Pickering much involved. New crowns were cast and machined and ready for pressing into the axle boxes, to be followed by white-metalling. However, SKP is behind three or four other locomotives in the queue to use the wheel lathe, so until the journals are profiled the axle boxes can't be machined to size. This work should start in May and once the wheelsets are ready the locomotive can be re-wheeled and returned to Swanage for re-entry into traffic. We plan to clean and overhaul the pony truck and bogie,	so this will constitute most of a bottom end overhaul. The loco's 10 year overhaul will be due in 2022, and we're looking at ways to shorten the downtime then. With the driving wheels removed it's possible to get at the frames, and a posse of SLL volunteers visited Tyseley in February to clean up wherever possible. When the frames were clean work moved on to the motion. Mary Bosworth took the rag to the LH slidebars and revealed the writing, "Sold Mr Woodham", dating from when BR sold the loco for scrap. The repairs on Manston are complete, bar a further inspection when the loco is lifted to overhaul the axle boxes. It's planned to do this at Tyseley when funding is available, but with Eddystone and Sir Keith Park needing work we don't know when that will be. Meanwhile the loco is in the yard at Tyseley. 34072 has been been in service in the early part of the year, and was the subject of a 30742 Charters event on 4th March. Subsequently it developed a problem with valve packings and was out of service while the 'Scottish engine' was at work. 34072 attracted good photographers for the Photo Charter and several of these were published on Facebook, etc. This image by Chris House of 34072 leaving Corfe Castle was striking. One or two photos from the day may well feature in the 2020 SLL calendar. The big news is the agreement with Swanage Railway that Sidmouth's frames will enter Herston works when Eddystone leaves, early in 2020. Workshop space is at a premium, and when the frames are indoors we will have to make good use of the parts which we have been gathering over the past several years. Currently the frames are on a rail wagon west of Norden station; they will probably move to the 'pad' at Norden for cleaning during the summer. Overhaul of Sidmouth's bogie and pony truck are high priority tasks as they will make the frames mobile. 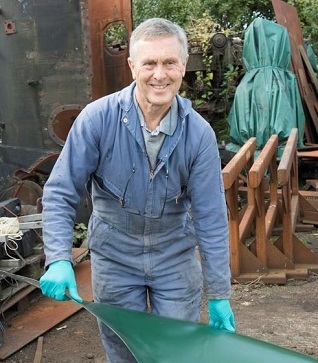 Here Phil Casey is painting a set of bogie wheels with apple green undercoat. Bulleid smoke box doors are a characteristic part of the loco; oval in shape with a different radius in the horizontal and vertical planes. SDR Engneering developed the necessary tooling to press the shape, and made a batch. SLL has bought the last two of these; one for Eddystone and one for Sidmouth. 80104 has remained a backbone of the Swanage Railway service and was involved with the excitement accompanying the visit of a well-known Scottish loco, to the extent that it was renumbered 80126, which worked in Perthshire in the 1960's. Our resident numbering expert, Robin White, unveils 80126. The real 80126 was built at Brighton in 1955 and based at Perth South MPD throughout its short working life. It was withdrawn in November 1966 and cut up in January 1967. The overhaul of Norman continues to reveal more expensive problems mainly associated with its axle boxes. The wheelsets have been dispatched to the South Devon Railway for profiling as fortunately the tyres are still good for another turn. The first boiler inspection is due to take place imminently so we trust the inspector doesn't turn up anything that we don't know about already. We and just one shareholder who is kindly sponsoring much of the work have taken the decision to do all the work which is necessary to see it through another 10 years, without it having to come out for major renewals mid-term. The net result is that it will really have to earn its keep once in traffic to repay some of these costs. No decision has been made regarding its next home; expressions of interest are invited. Norman's cylinders have been fitted with cast iron liners and rebored. 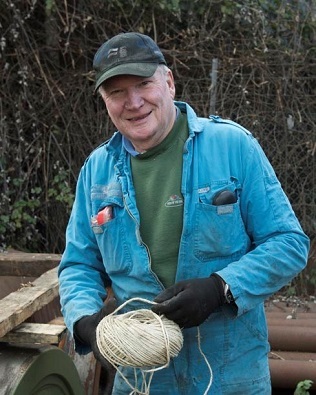 We're sorry to report that Bob Bevis, a long term employee of SLL and key member of our team, has decided to retire, and left us at the end of February. 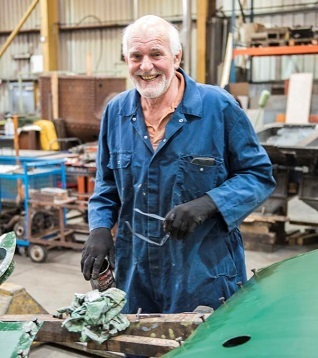 Bob started as a shareholder and volunteer, and joined our full-time staff when Manston was being restored. 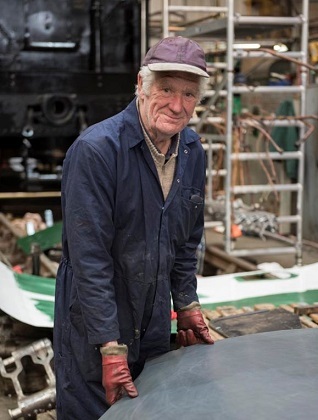 He worked on all of our fleet over the years, most recently on Eddystone and Sir Keith Park, and was pivotal to the construction of our three new-build Bulleid tenders. Bob will remain a director of the company, and promises to turn from game-keeper to poacher by joining our regular volunteer sessions. He was noted for his energy, analytical approach, and plain speaking, which nearly hid his warm nature. Bob spent a lot of time managing and encouraging our volunteers, or "expendables" as he preferred to call them. On one occasion volunteers Ray Grace and Chris Worby completed a task correctly and without referring back to 'management', a rare feat according to Bob. They were rewarded with a 'silver washer' medal. It's customary to look ahead to the coming year, and for SLL 2019 is a year of promise. As a company we have committed to continue to improve our working practices and productivity. The completion of 257 Squadron has given us the opportunity to focus on Eddystone; it may or may not be steaming by 31.12.19 but rest assured it won't be through lack of trying! The repairs to Manston will soon be complete, and we will be able to start funding its overhaul. When Eddystone leaves Herston we intend to bring Sidmouth's frames into the works; at first the work will be mainly undertaken by volunteers, frame cleaning and painting. Getting the bogie and pony truck under the frames is also a priority as it then becomes mobile. One fly in the ointment is Sir Keith Park which has had a knock in the bottom end which needed attention. 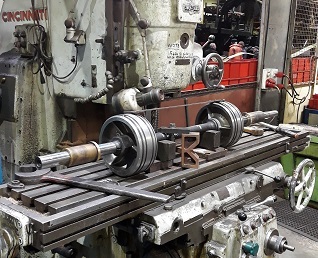 Getting to the axle boxes is a major task, and as there's no point in doing half a job, we decided to undertake a complete bottom end overhaul now to make for a speedier overhaul in three years time. The loco moved to Tyseley at the end of December and all the driving wheelsets have been removed for examination and repair. In 2019 we will continue to build up our machinery and tools, bearing in mind the limited space that we have in Herston Works, and we also hope to increase the number of staff. In the early days there were dire predictions of losing our volunteers as they wouldn't wish to work alongside paid staff; we have consistently proved this to be nonsense. Our volunteer force is increasing and will continue to do so as long as we progress our projects at a decent pace and make sure that everyone feels welcome, whether skilled or unskilled. Just as important are those shareholders who rarely if ever see their locomotives; without their financial support everything would grind to a halt! Below you will see some of the excellent work recently carried out by staff and volunteers. It's a real pleasure to write that 257 Squadron has been in service since October, taking part in Swanage Railway's "1948 Exchange" Gala, the S & D weekend and SLL's shareholder driving and firing dates, as well as regular service trains. One of our supporters who goes under the name The Southerner makes excellent railway videos. Here's a recent product featuring 257 Squadron's commissioning and re-entry into service during the second half of 2018. We're focusing on those tasks that are much simpler to do before the boiler returns. The inside piston valve needed to be relined; it was just short of scrapping size and unlikely to last the full 10 years of the loco's next boiler ticket. The task involves boring out the casting and fitting new cast iron liners. 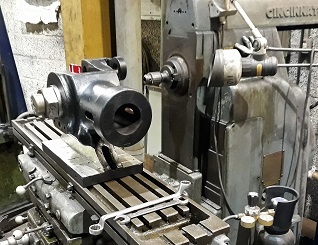 Work is being done by Bryn Engineering who are also skimming the outside piston valves and the middle cylinder to remove the slight ovality that comes from years of service. Eddystone's LH piston valve after being skimmed, with the swarf yet to be cleaned out. When we stripped Eddystone we took care not to damage the smokebox in the hope that it could be re-used. Three years on it doesn't look too good and we've decided to replace the body. Buying the rolled tube with the required cut-outs isn't too expensive, though all of the fittings must be carefully removed, cleaned up and welded back on to the new body. The smokebox was brought into the workshop for inspection. The body is destined to become razor blades but all the fittings will be used on the replacement. The superheater header is a large casting which connects the main steam pipe to the superheater elements. There are 32 elements, meaning 64 orifices, each of which has to be ground to ensure a good seal. Volunteer Neville Crook completed this job in November. The first official hydraulic test of the boiler was on 14th January. The boiler reached 375 psi with very minor leaks which need no attention at this stage. Subsequent hydraulic and steam tests will doubtless identify glitches needing attention. Work on the repairs of Eddystone's boiler are now complete and the boiler inspector was on site at Buckfastleigh for a hydraulic pressure test. The boiler reached 375psi (50% above normal operating pressure) successfully. We're also overhauling the superheater elements and will ship these with the header to Buckfastleigh to be installed there. That will permit the full boiler hydraulic and steam tests to be done off-site. The boiler's return to Herston will be a few weeks later than previously intended but will minimise the chance of work being needed when the boiler is on the frames. The knock coming from Sir Keith Park has not gone away (we wish!) and all of its driving axle boxes are being examined. It travelled to Tyseley on Wednesday 13th December and a team of SLL volunteers visited Tyseley in the following week to strip the brake gear, sanders, springs, etc. We also plan to examine/repair the bogie and pony truck while they're accessible. 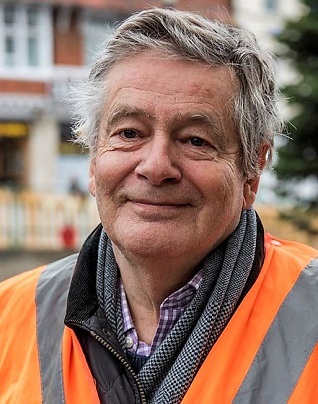 We have some ring-fenced funds to spend on this work, and we expect Sir Keith Park to be back in action for the 2019 season. 34053 was resting in the services on the M40 when it caught the eye of Andy Lovell. All of the driving wheels have been removed on the Tyseley wheeldrop. Measurement of all of the hornstays and axle boxes is being made to check the geometry of the loco and identify damage or incorrect settings. Repair work on Manston is essentially complete. The loco will remain at Tyseley until we are able to commission the work on the axle boxes, the starting point of its overhaul. We are prioritising the completion of Eddystone at present, so we may have a few months pause until there's money in the kitty to start this job. In one of Chairman Simon Troy's recent shareholder updates (aka begging letter) he asked for a sponsor for a new smokebox door for Eddystone. The current one is life-expired and making a replacement is a specialist task as they are oval and domed; it costs about £3,000 to have one made. We were pleased when a sponsor came forward after a few days, and even more pleased when a second sponsor got in touch. A short discussion ensued and we now also have a sponsor for a new smokebox door for Sidmouth, whose original went for scrap a while since. The speedometer we recently acquired for use on Sidmouth was exhibited at the Warley model railway exhibition. SLL volunteer Claire Sheppy and members of her family exhibited their vintage Hornby O guage layout and included the speedo as part of the display. Work on Norman paused in December, not least because the guys at Bryn Engineering were busy at work on Eddystone's valves and cylinders, see above. Currently the cylinders are being bored to accept new liners, and a trip to Wigan to review progress is expected in the next few weeks. Once again we're happy to report that 80104 has been behaving and is in regular service. The sheet metal that covers a loco is perhaps not the most exciting or interesting part of the machine, but it's the part we see, and which defines its style and colour. There's also a lot of it, made from dozens of pieces, some very oddly shaped with complex curves which require hours to manufacture and finish well. As well as being functional it needs to look good, and as it's typically made of 16 gauge sheet steel (that's 1/16 inch or 1.5875 mm) it's liable to corrode and need major repairs of replacement when overhauls are due. Norman Lush can turn his hands to many jobs. He specialises in cleaning the most dirty sheets and has a limitless appetite for rubbing sheets down with wet and dry paper. 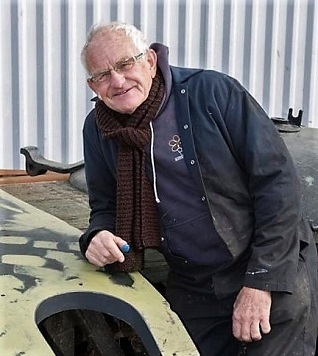 John Heath was responsible for much of the welding repair on the crinoline primary structure on 257 Squadron and the repairs of sheet metal work on Eddystone. No surprise then that in Herston works a lot of people spend a lot of time working on loco cladding, and that it's almost entirely done by volunteers. Generally known as The Cladding Team there's a core of six who normally all work on Tuesdays and other days in smaller numbers. Overhauls start by removing the cladding and getting the worst of the rust off before applying a coat of primer. Such parts are then put away for a year or two until the loco is being re-assembled. In the case of Sir Keith Park's restoration there was no original cladding at all, and although 257 Squadron's was an overhaul in practice virtually all the cladding was re-made. Not much new work has been needed for Eddystone, as care was taken in the stripping operation. All inside surfaces are painted with supplies taken at no cost from the local dump. When finished the outside surfaces have as a minimum primer, two undercoats and two topcoats. George Parrot is multi skilled and has saved us a lot of time and effort by lending us his pneumatic riveter. Mike Hall is noted for his meticulous care in whatever job he is asked to do, and is never known to say no. Leader of the team is Dave Ensor. The core of the team are the Tuesday regulars, Dave, John, Ian, Mike, John and Norman, assisted by other volunteers as available. Painting is the domain of Ron Bennett our 91 year-old volunteer, helped by Mike Frackowitz and Robin White, whose special subject is cabside numbering. Ron was 19 years old when Eddystone entered service with the Southern Railway. He trains our other volunteers - mainly lads in their 60's - first on primer, then undercoating and finally passing out on gloss, with a lot of rubbing down along the way. Ian Odd marks out, drills and helps to rivet the sheets to the underframes. There were hundreds of rivets to be fixed in place on 257 Squadron. Dave Ensor sees his role as to keep everyone else busy and happy. Purbeck resident Robin White works with the team. His 'special subject' is number transfers. When first restored Sir Keith Park ran with plain white numbers. 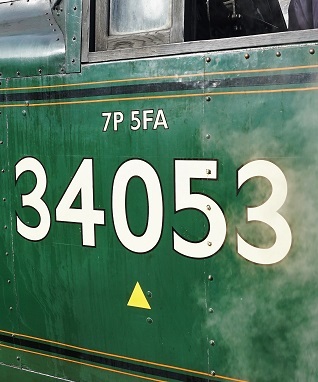 Robin sourced the protoypically correct numbers with a black outline which now adorn the loco. Honorable mentions are also due to Mike Evans, Stuart Magnus, who is also a signalman at Corfe Castle and a member of railway's Council of Management and to Matthew Sell who helps out when not producing high quality steam videos. Top marks for a mirror finish by Mike Frackiewicz with 257 Squadron's final gloss coat. For the record 257 Squadron had about 50 panels comprising the smoke deflectors, boiler sheets and cab. 95% of this had to be replaced. By contrast around 95% of Eddystones's sheeting will be repaired and used again. The renovation of crinoline and sheets will have taken about 6 months. This year's shareholder driving and firing sessions were spread over five days in November. A record number of 76 participants enjoyed a round trip driving and firing 257 Squadron. As usual priority was givien to new shareholders. Colin Mitchell from Sidmouth and Alan Heeks from Bridport pose on Swanage station after their driving and firing trip, as 34072 257 Squadron runs round ready to collect the next SLL crew. We've been thinking about machine tools we use at Herston and how suited they are to the range of tasks we face, and their condition. All our current kit was 'pre-owned' when it arrived so it's not surprising that some is long in the tooth. Our large vertical mill is not working correctly, and only runs on manual feed, which is unsuitable for large tasks. The small universal is simply too small so we resort to using the horizontal borer on jobs it is not really suited for. What we need is a large Vertical and a large Horizontal mill or a large Universal mill. These second hand machines can cost up to £15,000 so any size of contribution would be gratefully received; if anyone can help us source or pay for this we'd love to hear from them. Our small milling machine is OK for small jobs - only. Our Cincinnati mill has the size and power but the lack of auto-feed is a major handicap. Likewise most of our power tools predate the 'cordless' age, and have been seen a lot of use. Heavy duty cordless drills, grinders, LED lamps, etc, are now widely available and would simplify many tasks. Replacing our current equipment would cost several thousand pounds, but this can be done item by item as funds are available. Donation of suitable tools or money to buy them with would be much appreciated.